I’m about to embark on the Beachbody Body Beast home workout programme and I needed a few pieces of training equipment to get me launched into it. One thing I needed was a set of dumbbells, so I had a choice of the usual bars with spin off metal or plastic weights, a full set of fixed weight dumbbells or a fairly new concept to me, a pair of adjustable dumbbells. 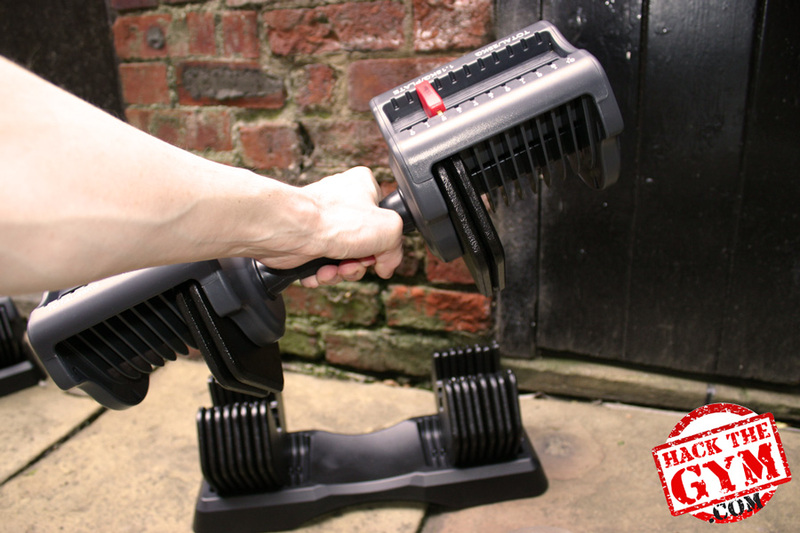 Adjustable dumbbells offer the benefit of changing the weight without having to manually add and take off the weight plates, you just dial in the required weight and lift the bar off its stand. Only the weight that you dialled lifts off on the handle. Adjustable dumbbells also offer the benefit over a full set of fixed dumbbells in that they save a lot of storage space and also don’t cost as much as buying say 12 pairs of metal dumbbells! After checking out the options available, I decided to go for the Orbus adjustable dumbbell system. This is my review. My pair of Orbus adjustable dumbbells arrived very securely individually packed. On cutting them out of their boxes I was struck by the quality feel that they had and they definitely look futuristic too. The grip has a comfortable curve to it and a rubber sleeving, so sat nicely in my hand. To change the weight, there’s a red interchange lever that you press down and slide across to make the selection. The ‘slide and lock’ mechanism slides quite nicely, though is a little stiff when stacking on the weights, no big deal though. Although the weights are metal, most of the actual dumbbell is plastic. That said, it does feel very robust, and as each individual weight disc is only 1.15Kg there’s no worry that the plastic weight engagement tabs will fail. Simply dial in the weight that you need with the Orbus ‘slide and lock’ system, lift the dumbbell up and the dumbbell leaves any unneeded weight sat in the cradle. The dumbbell goes back onto the cradle pretty easily as well. I didn’t find that the dumbbell clashed with the weights left on the cradle, it all guided back down nicely. There are some separating fins built into the handle, that spread and move a little to accommodate the weights and make for a problem-free lift and drop. 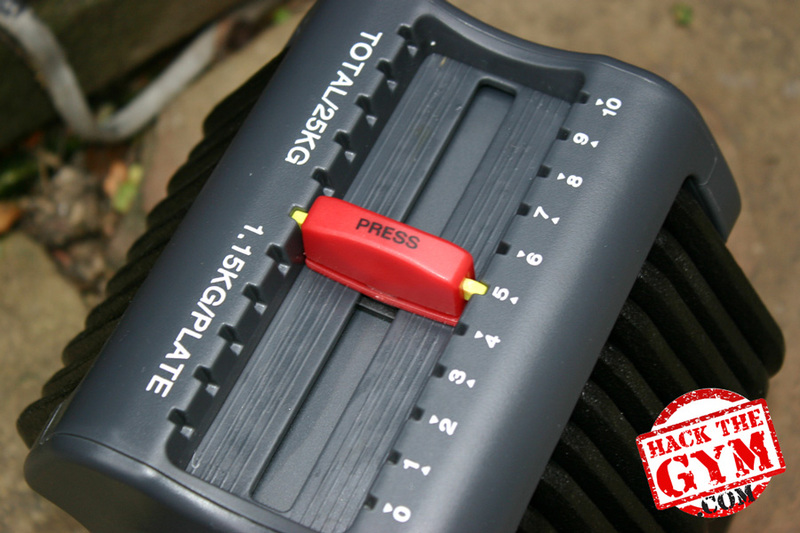 There are 20 individual weights on each Orbus adjustable dumbbell and the dumbbell itself weighs 2Kg, so there are plenty of increments as you progress up the scale. 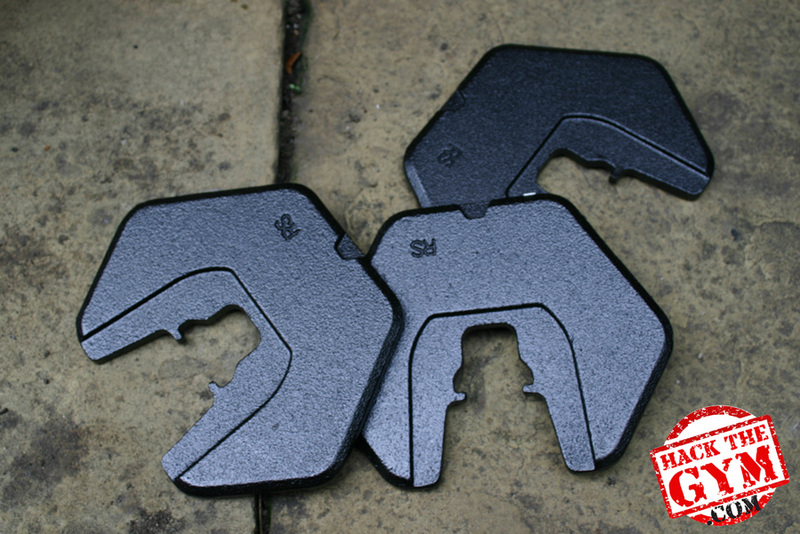 Essentially, these weights will go up from 2Kg in 1.15Kg increments all the way to 25Kg. A number of other adjustable weight systems require larger weight increments, making increased performance progression much less smooth. One of the things that I thought was a bit of a pain at first, was that the weight selector dial doesn’t go up in weight, it goes up in arbitrary numbers from one to ten. It’s a bit odd, as I had to work out the actual weight that I was lifting each time, but once I got the hang of it, it made a lot of sense. 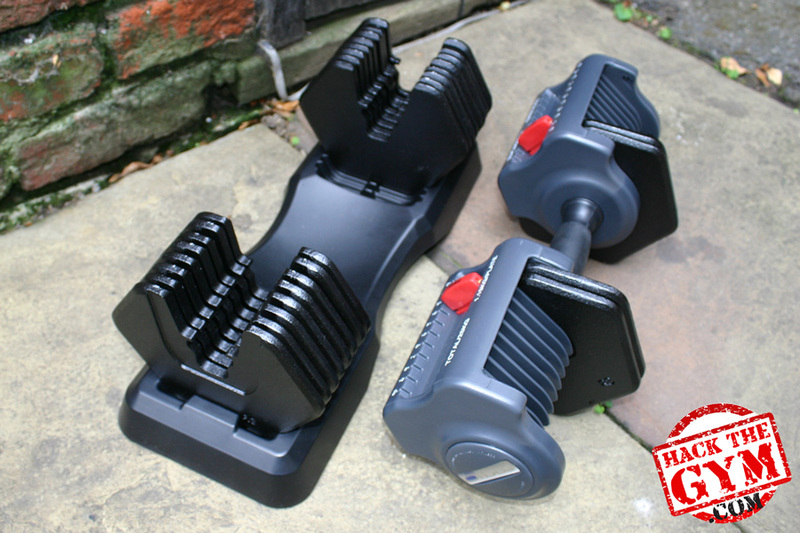 The Orbus dumbbells looked a bit wide when I first took them out of the box. They’re 43cm (17”) in length, so they look bit of a monster. Putting them through their paces with curls, bench presses, tricep extensions, shoulder presses and squats, they performed excellently and my concerns about the width of the dumbbells was not a problem at all. The weight change between sets was super smooth too, with no problems and a quick weight change in seconds. I’ll let you know how I get on with the Orbus adjustable dumbbells as I embark on my Body Beast training. In the meantime, I can tell you that these dumbbells provide a hassle free workout and will probably exceed your needs. They provided me with a massive wide range of different weight and in good small increments from 2Kg to 25Kg per dumbbell, while reducing the amount of storage space I needed and probably cost me a hell of a lot less than buying many sets of fixed dumbbells. Let me know if you have any questions about these weights and I’ll try to answer them for you.